Lagan Brick is a long established manufacturer and supplier of high quality clay facing bricks and specials to the Irish and UK markets. The company currently has ISO 9001:2008 and ISO 14001:2004 accreditation. Having effective quality and environmental management systems are essential for Lagan Brick to continue to improve and streamline its day-to-day operation particularly in terms of maximising efficiency and minimising costs. This, along with providing the company with a competitive sales advantage, has never been more important. Lagan Brick is registered with Lucideon (formally known as CICS) as Lucideon is recognised as the lead ISO registration body for the ceramic industry in both Ireland and the UK, if not globally. For this reason, achieving ISO accreditation with Lucideon adds significant credibility and provides assurance to both our vendors and customers that Lagan Brick are operating to the highest possible standards. Lucideons' auditors are highly qualified and highly experienced and, most importantly, know the ceramic industry. The auditing process is extremely comprehensive and conducted in a rigorous but very fair manner. To add, the auditors have frequently offered very useful practical advice during the auditing process. It is for these reasons that Lucideon is viewed as a key contributor to the continual improvement of the company's management systems and therefore the continued success of Lagan Brick. 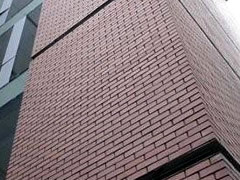 Lagan Brick, or Kingscourt Bricks as it was then known, first achieved ISO 9002 accreditation with Lucideon in 1996. Since that time, the ongoing changes due to the management systems are clearly visible and quantifiable. We now hold ISO 9001:2008 accreditation, were awarded ISO 14001:2008 accreditation in April 2009 and are currently working to achieve OHSAS 18001:2007 accreditation. Investing in ISO management systems should not be viewed as "extra paperwork" or as an "additional cost" but instead the concepts should be embraced and viewed as an opportunity to improve a company's operations. This investment will in turn have a cost-saving impact over the long run. It is our view that this can only be achieved with a registration body that know your industry and this is why we at Lagan Brick are registered with Lucideon.